Discover the Dining of London! It’s amazing how many outstanding restaurants and cuisine type make their home in London – amazing, but not surprising. As one of the major hubs for air travel and a truly international city in nearly every sense of the term, London should be a destination for every self respecting food lover out there. Whether it’s the traditional hearty domestic fare or the melange of international flavours that have put up shop, you won’t have a hard time finding something to tickle your tastebuds. Food festivals, celebrations and ordinary nights out can transform your holiday through the magic of the food you choose. Opt for a taste of the far East in the sensational Korean or Japanese restaurants, bask in the aromas of the rich French offerings or try and hunt down the best curry in all the land (which is no easy feat!) – there are so many opportunities for great dining that you may run out of meals before your trip is over! 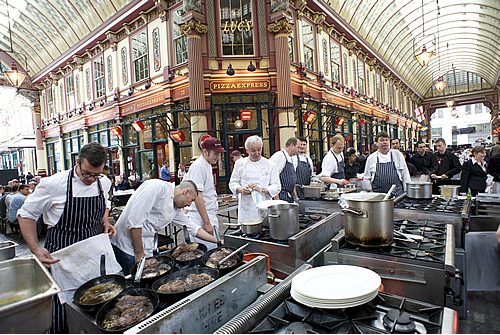 Take a look at our suggestions below of great culinary delights to be had this fall in London. Really, you can’t go wrong with almost anything you choose but it never hurts to have a few more helpful dining tips if you happen to find yourself in London during this season. For anyone looking to sample the absolute best o the best when it comes to world food and a bit of entertainment, consider buying a pass to this culinary adventure. The beauty of this festival is there is an option to fit every budget, ranging from the reasonable restaurant hopping at 50-60 GBP to the high end of 125 GBP at some of London’s finest establishments. Whether you’re interested in special screenings of classic movies or perfect wine pairings with dinner, never will you be as impressed with a night of dining out than this. Let’s face it, if given the chance between eating traditional British fare and that of the French, very few people would opt for the former. With the rich flavours and delightful pairings of their vintages and pastries, the French have cooking down to an art form and fall is the perfect time to enjoy it. From the West End to Battersea or even Columbia Road, you can find some delightful French favourites in café style to formal sit down affairs. These are just some of the many offerings available on a holiday or night on in London which can be made perfect with a great meal. For more information, be sure to check out our friends at Heathrow Express for pointers on how to enjoy this epicurean epicentre!